I’m submitting this post as my very first Works For Me Wednesday (WFMW) a “blog carnival” hosted at Rocks In My Dryer. Basically, the idea is that on Wednesdays I’ll post a little tip I’ve learnt – anything at all that has “worked for me”. I’m not sure if I can sustain beyond this entry but I thought this remedy is worth sharing. Hubby-jr suddenly developed hives (urticaria) when he turned 18 months. At first we thought he was having a very bad reaction to mosquito bites but as it persisted we discovered that it was hives. Antihistamines made the hives disappear but when we stopped administering the medication, the bumps would appear all over again after a day or two. Guessing that it must be an allergic reaction I went into a wild hunt for any possible cause. After weeks of elimination, I kinda hit a dead end. I could only conclude that it was most probably something environmental as it seemed to flare when he played outdoors. And it seemed to emerge at exposed areas such as his arms and legs. Well having decided that I couldn’t possibly confine him indoors, I made him wear long pants all day long. That wasn’t easy as it’s really hot living in Singapore. But Hubby-jr never complained. Four months of feeding him antihistimines on and off and witnessing the hives flare up now and then, wore me down emotionally. Sometimes my son would wake up with very large swellings on his forehead and it broke my heart. You bet I prayed very hard. Then one day, an acquitance called me just to ask me something and we ended up chatting. Lo and behold her daughter too suffered from hives for months and was cured by a remedy someone shared with her. Yes, of course she told me what it was… not only that she gave me some a day later. 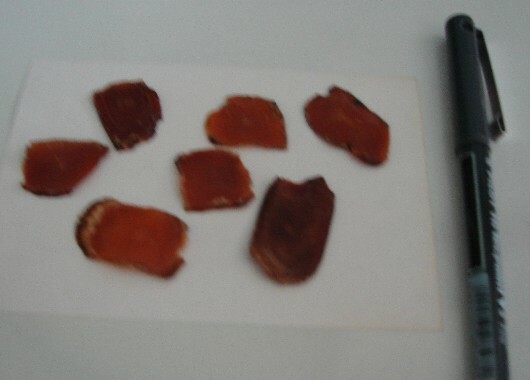 Her remedy was – Korean Ginseng (Panax Ginseng) slices! As Hubby-jr was only 18 months then, I soaked one small slice of Korean Ginseng (reddish brown in colour) in about 50ml of hot water covered for approx 30 mins. The essence of the ginseng would have transferred to the hot water by then. After removing the slice of ginseng I mixed the ginseng water with Ribena to make it more drinkable and fed it to Hubby-jr. Two days later, I gave him another dose. After 6 doses (with breaks of 2 days in between each dose) of the Korean Ginseng drink Hubby-jr was cured of hives! Seriously! It was AMAZING! A miracle! And I believe God led it to me. I’m not sure how accessible Korean Ginseng is in other parts of the world and in what form they are sold. Over here in Singapore I can buy them in slices at Chinese Medicine Shops. They look like this. Pretty cool – and welcome to WFMW! I was looking for a remedy for the hives thingy when I came across your writeup about you boy having it and that you were introduced to the Korean Ginseng by a friend. I will have to try it out and hope I can get it in KL. Like you said the antihistamine is no help. I am at my wits end with this problem for the past 1 1/2 months. Be it morning, day or night its scratch scratch scratch until my whole body is scared!!! Thank you for sharing and I pray it works and of course with lots of prayer too.